America’s Favorite Dish: Celebrating a Century of Pyrex opens June 6. In association with the exhibition, we’re launching Pyrex Potluck, a website featuring over 2,000 Pyrex items in the Museum’s collection sortable by pattern and date. Features will include digitized advertisements, articles on the history of Pyrex and oral histories conducted by the staff of the Museum’s Rakow Research Library, who have gathered personal perspectives from designers, engineers, and marketing staff who worked with Pyrex products. Each month, we’ll be featuring a Pyrex-related website on Pyrex Potluck where anyone who loves Pyrex can find information, photos, and lots of great stories. 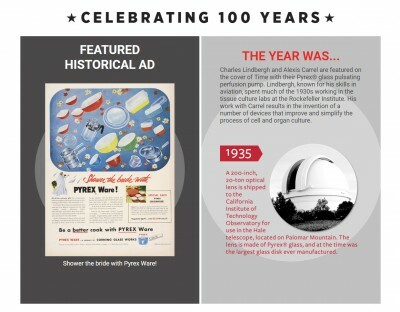 This month, we’re kicking off with Pyrex 100, a special site on PyrexWare.com celebrating 100 years of Pyrex. Mike Scheffki, a representative from World Kitchen, shares what you can find on Pyrex100.com. 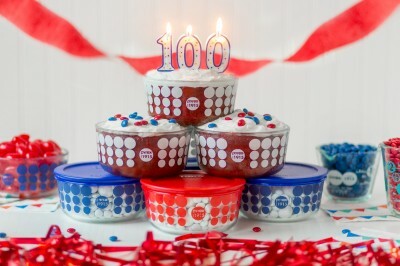 Discover what’s in store for the Pyrex brand’s 100 year anniversary celebration in the U.S. Check out the coveted limited edition anniversary product, available for purchase through 2015. Choose from an assortment of colorful storage, measuring cups and portable bakeware bags inspired by a vintage classic. And be sure to complete your collection with the limited edition engraved pie plate with the Pyrex 100 year logo. 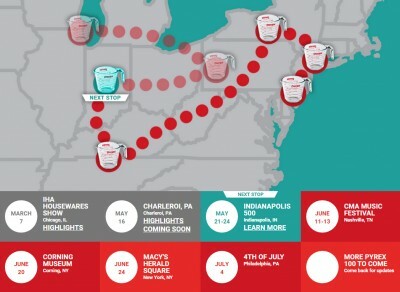 Don’t forget to check out where we’re taking the World’s Largest Measuring Cup on tour this summer, as we may be coming to a city near you with Pyrex prizes, activities and giveaways galore! Also, you can learn about our #raiseyourglasssweeps and enter for a chance to win two airline tickets to anywhere in the continental US! The World’s Largest Measuring Cup will make its 5th stop on tour here at The Corning Museum of Glass in Corning, NY on June 20, 2015. More details to come soon. Visit Pyrex 100 at www.pyrex100.com and stay tuned for more featured Pyrex sites each month through 2015!